When installed on the bike new chain is often required to correctly identify its length or number of links. Not long enough chain can lead to difficulties when shifting to large gears. Insufficient short – to excessive sagging and spontaneous release of links from the stars. Determine desired length of chain always take into account not only the design of the bike, but the frame geometry and dimensions of sprockets and cassettes. In most cases you can simply compare the new with the old chain and shorten (lengthen) it to the correct size, putting or removing unnecessary links. If the bike decided to install a new sprocket to set the desired number of links in the described way does not work. To determine the required length of the chain to install it on the biggest sprocket and pull it, removing the rear shifter in the full forward position. Measure the desired length of chain in the wearing position, add to it 2 link. 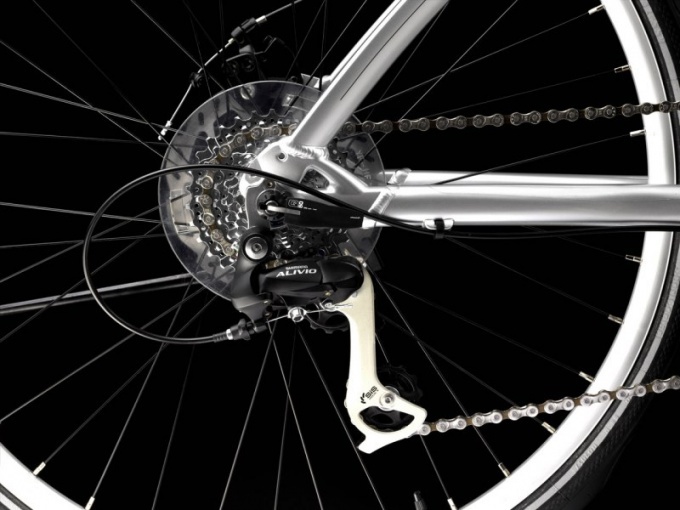 Please note that mounting bikes when sizing circuit rear shock definitely set in a position in which the tape as removed from the system switching speeds. Pass the chain through the foot of the tensioner is not necessary. In addition, to determine the length of the chain can be and setting it to a larger front and smaller rear sprocket. At the same time with the rear derailleur pull links so that its frame was directed strictly downwards, i.e. the line connecting the centers of the rollers, the tensioner was vertical. For road bikes, equipped with Shimano, the manufacturer recommends to determine the length of the chain, pulling it on the smallest sprocket. At the optimum length of the tensioner should not have any binding when you move. Often there are recommendations to shorten the chain on a 1-2 level, if the rear switch has a short frame. Be very careful following this advice. A chance to make a mistake with this shortening there is always, and a possible damage to the chain and switch speed when switching to the big stars. Usually on a road or hybrid bike used chain length 114-116 links or less. On the mountain – length: 106-108 units or a little more.